Check out Samsung Galaxy A50 price, release date, specifications, pros and cons. Samsung Mobiles, the South Korean smartphone giant is looking forward for the 2019 models. The naming of the device has already been confused but looks like now the company is making it simple by launching Galaxy A50 just like the Galaxy M30 smartphone. 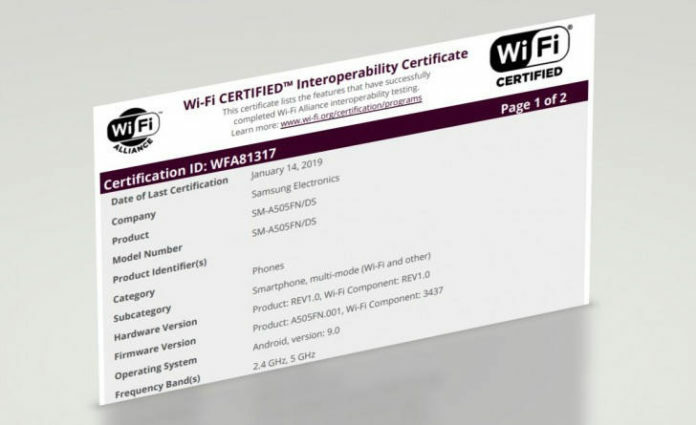 We have in the news that a mysterious Samsung Galaxy phone with a model number SM-A505FN/DS has been Wi-Fi certified by the authority and it could be named as Galaxy A50. Frankly speaking this could be the name of what was expected to be either Galaxy A7 2019 or Galaxy A3 2019 model. There is also Galaxy J7 2019 and Galaxy J3 2019 expected to launch. According to known specs, the device comes with a 4000 mAh battery and a 24 mega pixel rear camera. It will run on Android 9.0 Pie out of the box and has got in display fingerprint sensor and gets wireless charging facility. Samsung Galaxy A50 launch date is expected to be in the last week of February 2019 at MWC event. Samsung Galaxy A50 Price has been known yet. It will be revealed at the time of launch which could happen at MWC 2019.